... or else, Mike Leake is going to spend a couple of years as an Opening Day starter in the American League. Of course Dr. D expects something WILL change. We're just commenting on how well this guy has been throwing the ball. Don't sleep on the cutter. 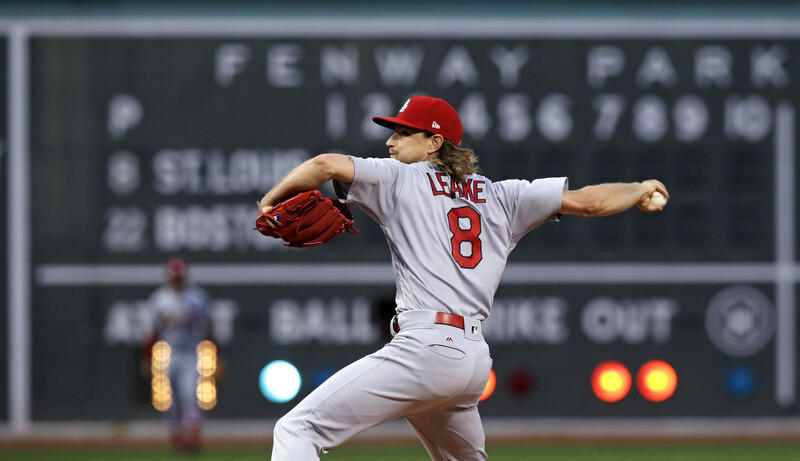 It generated Leake's second best whiff rate last season at a hair under 11%, and that was before he joined Seattle where it bloomed to a 20% whiff rate (for actual reasons). Here's a pretty neat article from early last season about how the Cutter changed. The 3rd .gif in the article shows one cutter from 2017 in slow motion, and it looks like the pitch attempts to break first right, then sharply left, then slides gently right again as it approaches the plate, which seems to me as something of an ideal inbetween pitch to muddle the pitch decision between Leake's sinker that breaks arm-side and his slider that breaks glove side. I see what you mean about the "multiple breaks" on Leake's 2017 cutter, though I wonder if it's not just an optical illusion. As I look at it more, it seems to be simply thrown inside, with a gentle break armside (which would make it a type of screwball). Also, it drops below (WAY below) the point where Bryce Harper perceives it - hence the weird swingthrough. In any case the movement is very odd and I can see why the weird swingthroughs. The mystery to me is why you would call such a pitch a "cutter." Where's the cut? It looks to me like a hard Fernando screwball. If somebody threw a "cutter" that failed to move differently from his fastball, but simply dropped -2 MPH, then such a pitch would indeed be a batting-practice (worthless) pitch, but thanks for pointing out the devastating movement on the ball. I'll update the graphic we made about the movement on his pitches (one cubicle to your right). If Leake has a wipeout, late-diving cutter to go with a weaponized changeup and a weaponized slider, there's no wonder he was a #1 starter during his time with the M's. (27:2 CTL with 1 hr and a 170 ERA+). If there is one thing that Dr. D's intuition insists upon, it's that a pitcher does not rip off 5 starts with a 27:2:1 CTL based on the luck of batters hitting shots at the shortstop. Leake has been throwing nasty stuff. OH BY THE WAY the word on TV last night was that his fastball was hitting 94 MPH. Will baseball never cease to surprise? By the way. Supposing Mike Leake hit the lotto and become another iteration of Jamie Moyer in his 30's, how much credit would you give Jerry Dipoto? Do you think Dipoto had anything in mind other than to acquire a durable 100 OPS+ pitcher? I don't. UND TAKE ZIS MIT YOU Dept. An intrepid Denizen (please remind me who you were?) pointed this article out in the Ichiro thread. It's full of poignant, intimate details from Ichiro's life, such as the fact that when he is not playing well, his wife wakes up to find him crying in his sleep. The bit about the baseball bat reminded Dr. D of his aikido dojo, in which it was considered the utmost rudeness to touch another person's sword or bokken. It also points out how scrupulously polite (Japanese read: "nice") Ichiro is to people. Makes me love Inchiro even more, but, man, what sadness. I just pointed it out to the denizens. He is trufly a baffling, driven and tortured human being. And yeah...what WILL happen after baseball? The Mariners should push Ichiro a little to consider coaching. He can have the comfort of a baseball routine, including working out with the players, teaching them how to limber up and prepare, throwing BP (heh! ), fungo'ing for the outfielders...he can do it all...and he can do that til he's 90. Does Ichiro have the patience to work with young American ballplayers who don't have his discipline and drive? I wondered the same thing about Edgar, but he has proven it to be a non-issue. Ichiro's personality, though, is far less laid back than Edgar. Either Ichiro will get extremely frustrated with young, immature American/Latin players and bail, or he'll have a new "great purpose"...a new mission that propels him forward and pushes his highly anomalous unquenchable thirst for perfection (severe OCD, in my opinion), wherein every day, he'll come to the ballpark with small attainable goals for the players. "If I can get Haniger to take his ab and oblique training more seriously today...if I can get a good fifteen minutes out of Zunino working on his hand-eye coordination in the cage, if...(etc)" and it will fuel him to some small measure of comfort and even satisfaction in his twilight years. I don't think Ichiro lacks patience with lesser talent...perhaps lesser preparation and work ethic. The article by ESPN talked about how he works out with Joe Schlub and company...that doesn't seem to bother him. He'll lose all respect for you if you disrespect him. He'll step back to avoid being anything other than polite if you upset him. But I'm not convinced that would prevent him from coaching under the right conditions. And, if anyone knows how to make Ichiro happy, it's the Mariners. His fastball isn't what it used to be, but he seems to have decent command and some good breaking stuff. You know, when it was 10 to 1 .